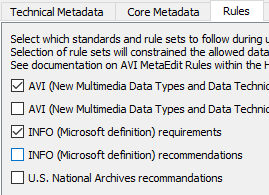 AVI MetaEdit is a tool that supports embedding, validating, and exporting of metadata in AVI (Standard and OpenDML) files. This tool can also enforce file structure and metadata recommendations and specifications from U.S. National Archives, Microsoft, and IBM. Initially funded by NARA (National Archives and Records Administration) supported by the FADGI; designed and led by AVPreserve; developed by MediaArea. It is Open-Source software which means that end users and developers have freedom to study, to improve and to redistribute the program (CC0 1.0 Universal public domain dedication. for the code developed by us).